Neil Harvey scored twice in the second half to help Hednesford Town to an important 3-2 victory over Buxton at the top of the Evo-Stik Northern Premier Division as The Pitmen kept pace with leaders North Ferriby. 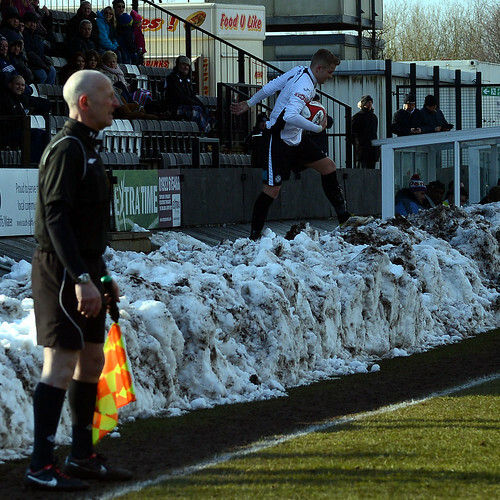 The Keys Park pitch was surrounded by three feet of snow but the surface was more than adequate and the home side looked comfortable in the first half as Kris Taylor opened the scoring on seven minutes with a superb left footed volley which flew past the unsighted Ian Deakin. Harvey hammered a shot inches wide of the post shortly afterwards, but Dan Crane had to be brave when he dived at the feet of Adam Muller to prevent the Buxton striker scoring an equaliser. Harvey was the man on the spot in the 54th minute when some impressive football down the right gave Elliott Durrell the chance to smash a low cross towards the back post but, just as the second goal looked to have settled The Pitmen, Buxton substitute Michael Towey ghosted into the area and finished past Crane to reduce the arrears three minutes later. Harvey picked up John Disney’s deflected cross and finished well beyond Deakin on 76 minutes but once again Hednesford let the away side back into the game when Mark Reed scrambled the ball in with three minutes to go. Crane was the toast of The Pitmen supporters however with a low save at the death to preserve three valuable points.